Famous for its seabird sanctuary, its rugged geographical features and The Marsden Grotto pub/restaurant, Marsden Bay is a lovely place to visit whatever the weather. Situated on England's north east coast, Marsden is an area of South Shields and lies a few miles south of the River Tyne on the North Sea coastline. The 'Leas' atop of the one hundred foot cliffs at Marsden are well know to runners as they are famously featured as the end-point of the 'Great North Run'; a prestigious half-marathon that starts in Newcastle-upon-Tyne and is usually run in September each year. When it's not hosting a major events, the Leas are popular with dog walkers, joggers and cyclists as the cliff-top cycle path joins a network of cycle tracks that criss-cross the region. The bay itself is reached by concrete steps that descend the cliffs to reveal a long sand, stone and shingle beach. Children of all ages love to play on the sand and discover the rock pools with their array of sea life creatures, providing endless fascination for enquiring young minds and adults alike. A quick paddle in the sea is the order of the day, especially as the water is usually freezing cold. The life-guard station and first aid post at the northern end of the bay ensures the safety of visitors to the beach - be sure to heed any warnings with regard to sea conditions and suitability for bathing and / or rock falls close to the cliffs. At the southern end of the bay is the Marsden Grotto bar/restaurant, which sits at the foot of the soaring limestone cliffs. It is built into the cliff-face and is reached by several flights of open wooden steps, which are great if you are young and agile, however, if you have mobility difficulties (or just don't fancy expending that much energy), there is an integral elevator (lift) which goes directly from the cliff-top car park into the Marsden Grotto. From there it is a few short steps on to the lovely terrace overlooking the bay and the magnificent geographical feature that is Marsden Rock. 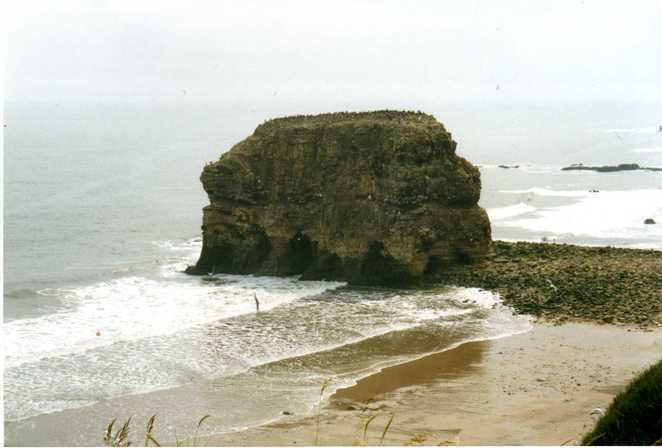 Once attached to the mainland, Marsden Rock now stands about 60-70 metres from the shore. It can be reached on foot at low tide but due to recent erosion it may not be open to the public at any given time. I live locally and in my lifetime I have seen the Rock diminish from an extraordinary feature with sea caves and arches to its now more familiar stack. The seabird colony is a big attraction to bird watchers as there are many nesting pairs of sea birds around the rock and the cliffs at Marsden Bay. The land is protected by the National Trust and lies adjacent to Souter Lighthouse, which is well worth a visit in its own right. On a sunny day you can enjoy a beer, soft drink or a coffee from the terrace bar while taking in the glorious views of the bay and the Northumberland coast beyond. The beach can be accessed by steps directly from the terrace, however, due to its stony nature, it may not be suitable for the less mobile. The Marsden Grotto offers fine fayre to the discerning customer, with a specialism in seafood and a pub grub menu available in the Cave Bar. It is also possible to book the upstairs restaurant for weddings and other functions. Needless to say, no cave restaurant could be without its resident ghost story, which is aptly told on the Marsden Grotto website and it is said that staff at the pub leave out a tot of rum each evening for the spirit of the smuggler who first made this place his home and is said to haunt this place. It is always gone in the morning. Marsden Bay is just off the A183 Coast Road and can be reached by car from the A1300 or by public transport from South Shields town centre. Simply take the local bus no. E1 to Sunderland, which runs every 20 minutes and stops at South Shields Metro station and at Marsden Bay along the way. The buses are wheelchair accessible and the timetables are displayed at each bus stop. If you are using several modes of transport, you might find it cost effective to buy a Day Rover ticket from Metro stations or bus drivers, which allow you to use all forms of transport in the Tyne & Wear area at a cost of just £6.80 for an adult for one day. Love and miss this place, great informative article, love the pics too.